One of my favorite skincare brands, NUXE Paris has released a new natural origin facial skin care line! If you haven't heard of NUXE, their a high end french skincare line that was created in 1957 by a research pharmacist who created the line based on natural botanicals and essential oils. After 10 years of research on anti-oxidiation, NUXE has developed an exclusive line for all women of all ages which targets oxidative stress, the main factor responsible for aging. New products in their new natural origin face line include Crème Prodigieuse Anti-Fatigue Moisuturizing Cream, Prodigieux Eye Contour, Creme Prodigieuse Enrichie for dry skin as well as a Creme Prodigieuse Night Renew . You can feel good about using NUXE Paris skincare because they contain no mineral oil, no animal ingredients, no chemical agents and they conduct regular testing registered by the French Ministry of Research. NUXE sent me some of the new natural origin skincare to try out and here is my review. The natural origin day cream is a moisturizing and and reviving cream that leaves a matte effect on normal to combination skin and protects against oxidative stress, the main cause of skin aging. This day cream is a NUXE innovation with its concentration of powerful anti-oxidant active ingredients like; Everlasting Blue, Blue Agerate, Cocoa Extracts, to moisturize, revive and protect the skin from oxidative stress. This moisturizer works perfect with my sensitive /oily skin. It's very hydrating and has a cooling effect when applied. The cream left my skin feeling soft, smooth and evened toned. An unexpected bonus was that it left my skin looking brighter and with a fresh glow. You should defnitely give this natural origin moiturizer a try if you have oily/combo skin. If your skin is dry, try their other mosturizer for dry skin, Creme Prodigiese Enrichie. The natural origin eye contour is an ultra hydrating eye cream that has a double action: anti-aging and anti- puffiness. It is light and non greasy and suitable for sensitive eyes and contact wearers. 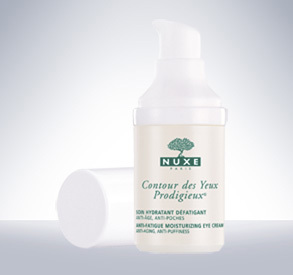 Nuxe eye contour provides a big improvement in the appearance of puffiness and reduces dark circles. This has to be one of the best natural eye creams I've tried yet! Just like the daytime moisturizer, it's very hydrating and left my eye area feeling soft, smooth and noticably reduced my dark circles and puffiness as well as left it noticiably firmer. You can learn more at: Nuxe.com. You can find NUXE Paris skincare at these fine retailers: Apothica, Beauty.com, b-glowing, SpaLook and Skinstore.com. Learn more about NUXE Paris by visitig their website at www.nuxe.com or follow them on Twitter. She also has great French soaps..